Our trip to Dallas included a visit to Northpark Santa, our favorite for years and the one from Blake's and my childhood, too. 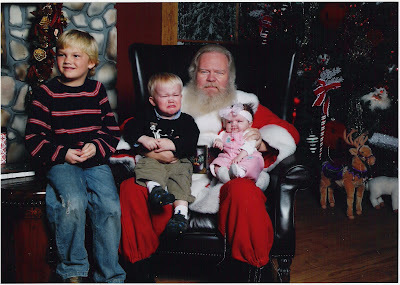 Out of the 6 pictures the photographer took, none looked really that good - meaning, with all 3 children appearing happy and filled with holiday spirit. So, I chose the most unusual of them all....each child looking in a different direction, one crying, etc. 'Tis the season for chaos and fun!